Pink tourmaline is vibrant and rich. Pink tourmaline engagement rings are rapidly growing more popular, particularly with individuals who prefer a unique design that doesn't rely on traditional diamonds. A rare and beautiful gem, pink tourmaline offers both value and distinction to create exceptional engagement rings. Pink tourmaline is a semi-precious silicate-based gem with anywhere from a pale seashell pink wash to a bold magenta hue. Lighter colors are considered more valuable, though exactly which color to choose is a personal preference. Depending on the jeweler, pink tourmaline may be called rubellite, which is a more stable color saturation that does not change in different types of light. The pink coloration is due to the presence of lithium ions in the stone's triagonal crystal structure, and the greater the ion concentration, the richer the color. Depending on the stone's natural quality, it may be heat-treated to improve the color. Tourmaline is found naturally throughout the world, including mines in Siberia, Australia, Brazil, and southern and western Africa. Tourmaline is also mined in the United States: Texas, Utah, Maine, and California all produce different shades of tourmaline. Pink tourmaline has several symbolic meanings, including being listed as an alternative birthstone for October as well as a preferred gift for the eighth anniversary. Mystical properties of the stone vary, but include several elements significant to marriage, such as emotional and spiritual love, balance, and devotion, making pink tourmaline engagement rings a popular choice for individuals interested in new age and metaphysical symbolism. Tourmaline comes in many shades other than pink, including green, orange, black, blue, yellow, brown, and rare two- and three-tone gems that shift colors through a gradient in the crystal structure. 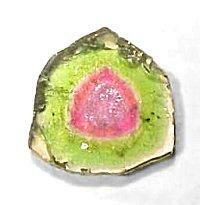 Watermelon tourmaline incorporates a pink core surrounded by a band of green, possible including a translucent band of white, making it very similar to a slice of watermelon. All told, tourmaline comes in more colors than any other known gemstone. Ironically, colorless tourmaline is considered the least valuable shade. Couples interested in affordable alternatives to diamonds may want to consider colorless tourmaline as an imitation diamond, however. While flaws and inclusions normally detract from the clear beauty of a gem, pink tourmaline engagement rings can actually be more valuable with flaws. Delicate inclusions help refract light through the stone, allowing even more color variation than with a flawless gem. Some lapidaries will intentionally scar a stone with a series of symmetrical carvings to increase its refraction and create deep patterns of light within the gem. These synthetic flaws can make an engagement ring even more unusual. As with any gem, however, large natural flaws are undesirable. Many pink tourmaline gems are set into silver, white gold, or platinum to avoid contrasting or clashing the pink shade with yellow gold, particularly for pale pink stones. Richer colors, however, work well set into any metal. Shapes vary for pink tourmaline rings, but the most popular styles are princess, emerald, and cushion cuts, as well as traditional round stones. Emerald cuts are particularly popular for multi-hued stones because the length of the gem allows the color gradation to be seen more clearly. While any gemstone can be set as a solitaire, pink tourmaline is often paired up with diamond accent stones as well. Some people prefer using colored gems - sapphires and amethyst are popular choices for their unusual color contrasts. Pink tourmaline is a popular alternative for other pink gems, including pink diamonds and pink sapphires, both of which may be more expensive than darker shades of tourmaline, though the colors are similar. On the other hand, tourmaline rings can be far more difficult to locate. 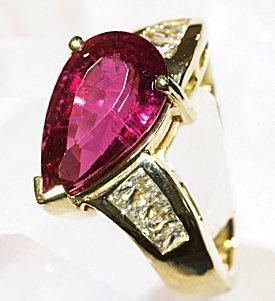 Few jewelers regularly stock pink tourmaline, though it may be easiest to find in October. For a better selection of rings, couples should consider browsing through online stores and loose gem inventories to get an idea of the different styles, sizes, and prices available. Custom jewelers may be able to locate suitable tourmaline gems, and can create a personalized ring with the unique stone. Before purchasing an engagement ring online, buyers should thoroughly investigate the merchant's reputation and business practices, including gem certifications, return policies, and other guarantees. Tourmaline is a relatively hard gem, but all the same care should be taken with the ring as caring for any engagement ring. If the gem includes decorative flaws - whether natural or artificial - extra precautions should be taken to avoid sharp blows that could exacerbate the imperfection, turning a valuable small flaw into a devaluing large one. Multi-colored tourmaline is especially prone to fracturing where to colors change, and these rings should be cared for gently to prevent damage. Ultrasonic cleaners are not recommended. From delicate rose to deep magenta, pink tourmaline engagement rings are a beautiful alternative to diamonds or other pink gems. Their intricate color variations make them exotic and unusual, while their inherent beauty is perfect to symbolize the beautiful love a couple shares as they begin their life together.